A private Egyptologist guide will accompany a minimum of 2 clients throughout the tour for all price levels. Travel with a Private Egyptologist throughout your journey. Float down the grand Nile River for four nights, visiting the temples of Luxor and Karnak, the Valley of the Kings, the temples in Aswan – book-ended by nights in Cairo, where you can explore the ancient wonders of the world including the Great Sphinx and Pyramids on our Land Of The Pharaohs tour. Egypt, indeed, offers wonderful things for the inquisitive visitor. From the moment one steps onto the busy streets of Cairo, five senses are overwhelmed by the sheer exotic. Exploration in this city of contrasts includes the fabulous pyramids and Sphinx, the Citadel, Sultan Hassan Mosque, the old town bazaars and, finally, the delightful Cairo Museum with its intriguing Mummies Room. Luxor, picturesquely perched on the shores of the Nile River, is where the adventure goes “afloat”. A five day Nile cruise ship is the best way to explore the temples that were purposefully built on the shore of the holy waters. Each day you disembark with an Egyptologist, discovering the secrets of ancient Egypt: Luxor and Karnak Temples, Valley of the Kings, Kom Ombo, Edfu and Philae. Land legs are found as the floating resort reaches the end of its odyssey in Aswan. Red rich soil and blowing sands spill down to the rivers edge, where feluccas hoist their white sails. A rewarding end to an epic journey is spent admiring the sites of Aswan, including the Unfinished Obelisk and a boat ride to the see the Philae Temple of Isis now on the romantic Island of Agilika. If you are intrigued by these lands of living history, we recommend an extension to Jordan. Explore the ancient marvels in this astounding city; the pyramids, Sphinx, Cairo Museum, Citadel, Mosque and Khan el Khalili Bazaar. Entry into the Great Pyramid and Mummies room included. 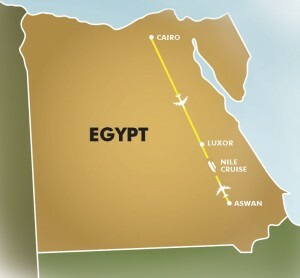 Fly to Luxor to discover the fabulous Temples at Luxor and Karnak. Cross the river to the fabled Valley of the Kings. Descend into tombs and delight at the colorful hieroglyphics and ornate sarcophagi. Board your luxury cruiser and float peacefully along the fabled Nile. Disembark with an Egyptologist to explore the ruins at Kom Ombo, Edfu, including the temple dedicated to the crocodile god, Sobek. Tour Aswan including the fascinating Unfinished Obelisk and High Dam. Wing back to Cairo and enjoy time to decompress before a night-time international flight. A perfect vacation ends – but not the memories!.